Going on holiday should be a wonderful experience. But we seem to travel with more and bigger cases these days, yet the spaces for the cases on buses, in cars and on trains hasn’t really changed in years. For some time, now, we’ve used a luggage courier service – specifically, Send My Bag – and the service it offers seemed to promise a great deal: your luggage would be collected from your house and transported to your holiday destination, so all you’d need when travelling would be a small bag or satchel. Last year, we decided to travel to Switzerland for 10 days. As we loathe airports, we take the train and, good as Virgin is, lugging on two large cases, finding somewhere to stow them and then collapsing into our seats wasn’t something that we looked forward to. Send My Bag seemed promising: someone from the company turned up two days before we set off, collected the bags for the first leg of our journey and upon our arrival at the St Pancras Hotel in London, they were waiting for us. It wasn’t until we were on the second leg of our journey on the Eurostar that we were notified of an excess charge of around £70. When we phoned Send My Bag, we were told it was ‘probably a mistake’ and if we measured the bags when we returned home it could send the information to the couriers, DHL. We did that, and the charge was dropped, but it left us with an uneasy feeling. Send My Bag wouldn’t cancel the charge itself because, it claimed, DHL was responsible. It stated: ‘DHL will insist Send My Bag pays unless we can prove there has been a mistake.’ Yet our contract was with Send My Bag, which seemed odd to us. What we found most irritating was that it wasn’t clear on the home page of the company that suitcase size is relevant. It gives a flat rate per bag per journey, and then provides a quote for three different weights. What it doesn’t make clear is that it then calculates it by size as well. You only discover that once you’ve clicked on ‘Book Now’. There are other issues, too: there’s quite a list of prohibited items, but, in my opinion, this list isn’t easy to find until you’ve completed the order or clicked through to the FAQs and searched the page. Among the items on the list are aerosols, liquids, pastes, gels, perfume, nail varnish, toner cartridges, tobacco, alcohol, money and medication. Luggage courier services are increasing in number but they share some worrying characteristics. Uni Baggage offers a similar service, but its list of prohibited items is, in my view, even harder to find. On the face of it, these services seem a good idea. They remove the stress of having to heave a suitcase around busy stations and they collect and deliver door-to-door. But the fact that they fly from a central hub – Birmingham – means there are a lot of things you can’t send, and, as we know, they make mistakes. And that can easily add more stress than carrying the cases yourself. This is a guest contribution by community member Ian. All views expressed here are Ian’s own and not necessarily those also shared by Which?. I’m with Lady Janey and also a last minute packer. We once checked in luggage at the airport that was supposed to be checked through to our final destination. We landed in Orlando and had to pick up our luggage to go through security then put it back on the supposed conveyor belt for our next destination. We had a while to wait for the next flight but it kept nagging me so I just had to check and found our luggage going round a carousel next to the exit door from the airport. Luckily we had time to check it back in for our next flight. Another time arrived at a hotel where our luggage was supposed to be taken up to our room. Half an hour later went back to reception and our luggage was almost out the front door and we had to almost fight the hotel person to let us take it up ourselves. Do I trust other people with my luggage? No. The problem is that other people always have access to your luggage when travelling, unless you never leave the UK and go everywhere in your car. Airports and their loaders are the worst: bricks are better treated than suitcases on planes, and in the US you have to use a case locking system that can be unlocked by their people, otherwise they simply break your case. We got back to the UK from the US once to find our cases ransacked and assumed it was US security as the US compliant locks had been locked up again. I wrote to them and said although I realised it was necessary, how upsetting it was and the least they could do was leave a note inside your case. Maybe a few people complained, because the next time there was a note left inside. It seems rather pointless if most of the items that are prohibited in cabin baggage are likewise prohibited in this service – which excludes deodorant and other liquids. Last time we returned from holiday, our suitcases contained around 20 litres of booze. British Railways used to collect your luggage from home and deliver it to your destination station. Those were the days. As a common carrier they had to transport anything at all. When we were young, my father used that service for our two-week seaside holidays. We had a large trunk which would be packed about a week in advance. It was very reliable. On arrival the trunk had various interesting labels pasted on it showing the route taken. Malcolm: that’s interesting since Virgin started a service very similar to that, but have now discontinued it. 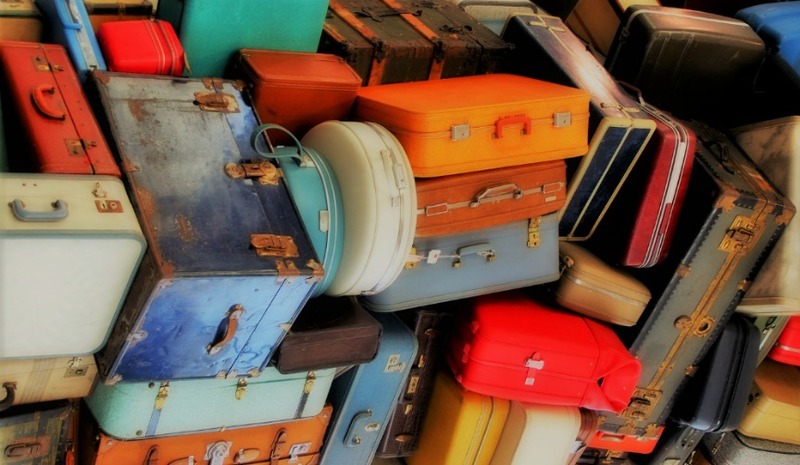 I looked into using a bag-carrying service but decided not to as I had similar reservations, and was also concerned about potential delays in reconnecting with the luggage. We then decided to hire a local chauffeur service to take us and our baggage to the airport and this has worked very well. The driver does the heavy lifting and I just push the trolley to the check-in/bag-drop point. No stressful driving, no airport parking charges and concerns, and no train difficulties [agreed – the luggage space is totally inadequate on most trains], The travel company lays on transport at the destination and the hotel porter takes it to our room so we hardly have to grapple with the baggage at all. Heaving it off the carousel at baggage reclaim is the only physical exercise involved. Arriving at the railway station in Venice once I watched as our large cases were thrown into the luggage boat and I had a momentary anxiety rush but all was well. They strapped a tarpaulin over the load to keep it together and protect it from spray and our bags were waiting in our room when we arrived – dry, complete and undamaged. I have found their time keeping to be excellent, so that’s never been th eissue. The real issue for us is the way the web site takes you through the process. It’s not until you”ve discovered the quote and clicked on Book Now that you find the page where you have to measure your case. I don’t think that’s on. They should state at the outset that Size Matters and will affect your final quote. I was furious when they sent us a demand for the extra cash, and I wonder now how many would simply have paid it. It was only because I rang them and made something of a fuss that I discovered DHL had made the error. And that’s the other point: we were paying and had made a contract with Send My Bag. How can they then tell us that we have to supply information to DHL because they’re levying the charge? Send MY Bag collect the cases and could easily check the measurements when they do. We’re now looking for a Train-based service. Spam post from Coolperjaxon1 above. Please report as such. Thanks, Ian. That’s been removed.